Photographs of Swords County Dublin taken between 1880 and 1910 including the two churches, several photos. 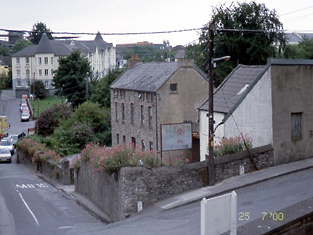 of Main Street, Bridge Street, Knocksedan Bridge St. and Feltrim Hill. Click on any photo to enlarge it. The original images are located at The National Library Dublin. The images are of high quality and suitably for printing and framing. The video images are of Swords in the last few years. Detached five-bay three-storey rubble stone built former Dublin Metropolitan Police station, c.1820, on a T-shaped plan with single-bay three-storey return to rear. 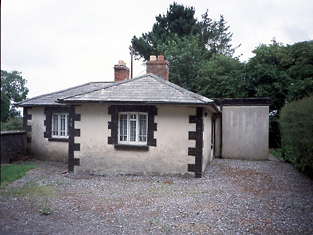 Re-roofed and refenestrated, c.1980, to accommodate use as offices. ROOF: Double-pitched; replacement fibre-cement tiles; concrete ridge tiles; roughcast over red brick chimney stacks; red clay pots; cast-iron rainwater goods. WALLS: Random coursed rubble stone to front elevation; roughcast to side elevations and return; unpainted. OPENINGS: Shallow segmental-headed openings; granite sills; red brick dressings; replacement timber casement windows; replacement timber panelled door. Detached three-bay two-storey red brick former curate's house, c.1895, with single-bay recessed entrance bay to right, having open internal porch. Refenestrated, c.1990. Cut-stone plaque ROOF: Hipped to left with gable; slate; red clay ridge tiles; finial; red brick chimney stack; yellow clay pots; timber eaves; decorative timber bargeboards to gable; cast-iron rainwater goods; gable-fronted to recessed end bay behind parapet. WALLS: Red brick; Flemish bond; cut-limestone dressings including advanced plinth and quoins; yellow brick courses; triangular parapet to recessed end bay; cut-stone plaque inscribed "Dominaire in medio"; cut-stone coping. OPENINGS: Square-headed window openings to left; granite sills; replacement uPVC casement windows; lancet-arch window opening to right first floor; granite sill; replacement uPVC casement window; timber panel over; lancet-arch open internal porch; timber panelled door; sidelights and overlights. 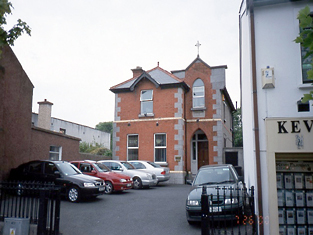 This building used to be owned to the Catholic Church in Swords. Detached three-bay single-storey Tudor style former school house with dormer attic, c.1835, on a T-shaped plan with gabled central bay. Design attributed to architect Frederick Darley.Three-bay single-storey rubble stone return to rear. 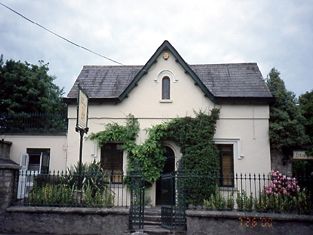 Renovated and extended to left, c.1980, comprising single-bay single-storey flat-roofed end bay to accommodate use as restaurant. ROOF: Double pitched and gable-fronted; slate; concrete ridge tiles; roughcast chimney stack to return; red clay pots; timber eaves with timber corbels; cast-iron rainwater goods; flat-roof to end bay. WALLS: Nap rendered to front elevation; painted; random coursed rubble stone to side elevations and returns. OPENINGS: Square headed window openings; granite sills; hood mouldings to front elevation; yellow brick surrounds to returns; replacement timber casement windows; round-headed window openings to attic; granite sill; hood moulding; timber fixed-pane stained glass window; round-headed door opening; moulded archivolt; replacement tongue-and-groove timber panelled door; stained glass overlilght. Some people aften ask me why I don't show photos. of the ''Real Swords'' , what they mean is to show images of derelict buildings which are mostly located on North Street. Well I think the town has suffered enough bad publicity without me adding to it. Sure there are a few unsightly places around the town which should have been made good years ago. North Street is the most obvious. Some of the buildings on this street have been derelict since the 1950's. One in particular has being empty going back to the early 50's, it's the old bakery located South of what was Heavey's sweet shop, the one with no roof. The other main derelict building which are located after the castle North Bound have been unoccupied over 10 years with no sign of anything happening here.These properties belong to Fingal Co. Co. They have given ''Low Priority'' status in relation to rejuvenation. The reason given is lack of funds. Anyway moving on down North Street on the opposite side before and after Des Kelly's shop are several bulding that were bought at the height of the Celtic Tiger. The first are two 19th century town houses which are in a good state of repair but left idle. The next is the old Sweet Shop / bookies bought at the same time and has also been left derelict for many years. The plan was to build flats and offices. Alas with the collapse of the economy these are now still waiting development and may well be in the same state in another 10 years.